The Geographical Review, vol. X, no. 4: pp. 197-222. American Geographical Society of New York (1920). 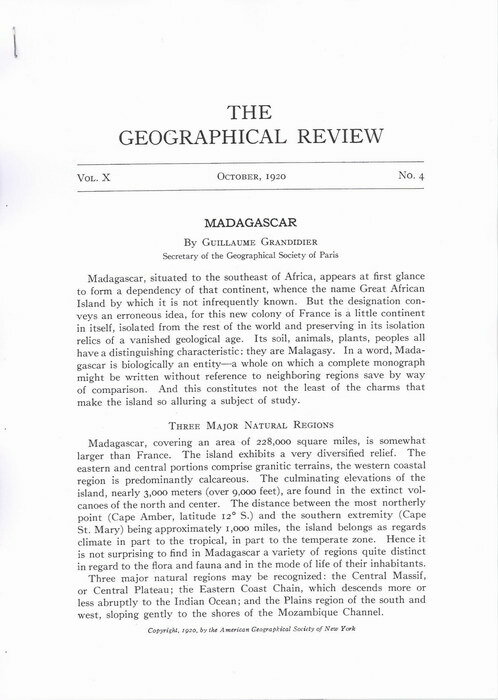 A general geographical overview of the country of Madagascar by French naturalist Guillaume Grandidier who was Secretary of the Geographical Society of Paris at the time. The text is illustrated with 20 photographs and two maps (showing the relief and ethnographic regions of Madagascar). 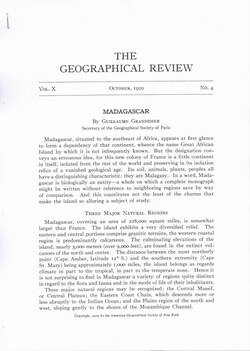 Madagascar, situated to the southeast of Africa, appears at first glance to form a dependency of that continent, whence the name Great African Island by which it is not infrequently known. But the designation conveys an erroneous idea, for this new colony of France is a little continent in itself, isolated from the rest of the world and preserving in its isolation relics of a vanished geological age. Its soil, animals, plants, peoples all have a distinguishing characteristic: they are Malagasy. In a word, Madagascar is biologically an entity � a whole on which a complete monograph might be written without reference to neighboring regions save by way of comparison. And this constitutes not the least of the charms that make the island so alluring a subject of study.